A controversial Gerard Deulofeu strike sent Barcelona on their way to a comfortable 2-0 victory over Malaga as they stretched their lead at the top of La Liga. 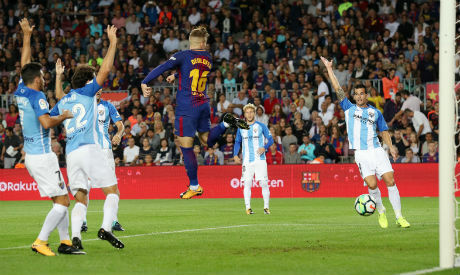 In the second minute at the Nou Camp, the ball clearly ran out of play before Lucas Digne crossed for Deulofeu, who flicked it in off a superb backheel, leaving Malaga irate. Barcelona struggled to break the visitors down as they searched for a second, which came in the 56th minute when captain Andres Iniesta fired home with the help of a deflection. Luis Suarez missed a golden opportunity when set up by Sergi Roberto as the Catalans failed to score a third but still moved four points clear of second-placed Valencia.